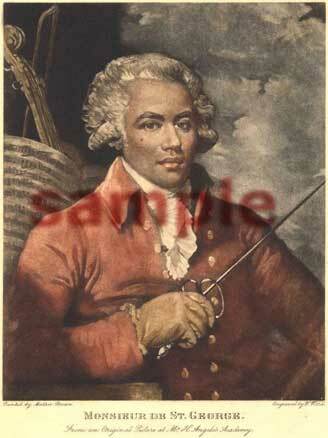 Mesieur Joseph de Bologne Chevalier de Saint-Georges, better known to fencing history as the Chevalier de Saint-George was born in the French colony of Guadeloupe in 1745. He was the illegitimate son of a wealthy colony planter M. Georges de Bologne and a slave of African descent born in Guadeloupe named Anne known as la belle Nanon. His father brought him to Europe and he was eventually placed in the care of the French fencing master Nicolas Texier de La Boessiere in 1756. It was at the elite boarding school of this fencing master that Saint- George acquired his more than formidable skill with the sword, which made him internationally famous in his lifetime. He was natural athlete and was also highly skilled as a swimmer, runner, ice skater, pistol shot, dancer and horseman. During the pre-Revolutionary period in Paris, he was amongst the most important musicians being a composer, violinist and conductor. He became music director of the private theater of the Marquise de Montesson. Many of his musical composition are still played today. His gracious demeanor, his handsome countenance and physique along with his considerable talents opened doors for him at the highest levels of society as well as gaining the admiration of the ladies. This portrait was a prominent fixture in Angelo’s fencing academy in London and is depicted in the painting by T. Rowlandson of a fencing assault at the Haymarket academy.